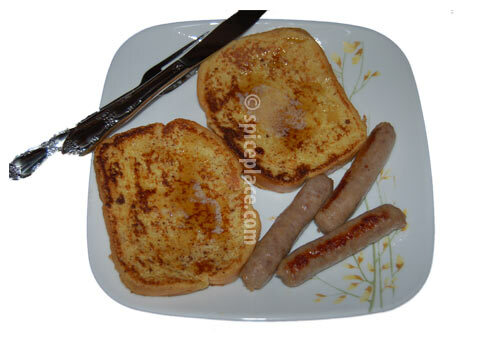 This is a delicious proven French Toast Recipe that we had for breakfast this morning. We like to use a hearty white bread so that the bread holds up after being dipped in the milk and egg mixture. A soft bread will simply fall apart. Our favorite here in the East Coast of the US is the Maiers Premium Italian Bread. Combine beaten eggs, low fat milk, Pure Vanilla Extract and ground cinnamon in bowl and mix well. Pour milk and egg mixture into a shallow pan that is large enough to let a slice of bread lay flat. Dip a slice of bread into the egg mixture let sit a second, then flip to dip other slide. Remove from egg mixture and cook on a well oiled griddle pan until golden brown on both sides. Recipe Yields: 5 two slice servings of French Toast. Serve with whipped butter and pure maple syrup.